Our hotel is 350 meters about from the beach. It has 29 wide and comfortable bedrooms all equipped with balcony, private services with shower box, TV LCD, Internet WiFi. The Hotel Maestrale has double, double with extra bed and family rooms, air conditioned, all with balcony and bathroom with shower box, TV LCD. Special offers for families and rates that can be the most favorable for all. All the bedrooms are comfortable and can host up to 4 persons. Suitable to relax with the family in a quiet area surrounded by the nature and close to the beach in San Benedetto del Tronto. Every room has WiFi for free, TV, private bathroom with shower box and balcony. Different among them by their furniture, our double standard bedrooms offers comforts and welcoming spaces. It is possible to use them as single rooms - young couples - single parents with children. 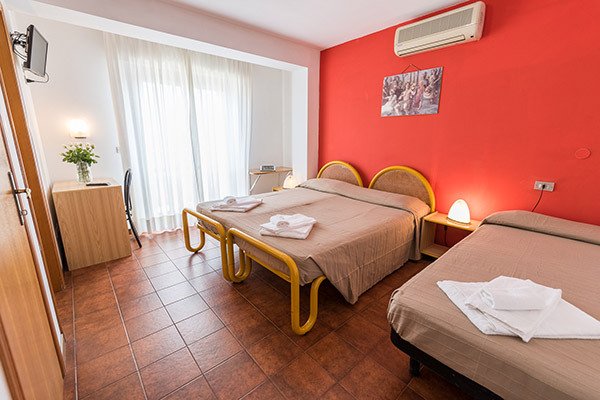 The ideal accommodation for all the families who do want to share the room with their children while on holiday; they are wide and comfortable, suitable for 3 persons.